Looking for fun and fabulous day trips from Brisbane. We have 25 top picks here from the beach to the rainforest, lakes and rivers, wildlife and adventure. Brisbane is a great city to both live and visit. It’s casual and laid back but there are options here for culture, great foodie experiences and more. It doesn’t have to hurt your pocket either, if you’re visiting the city make sure you also see our top ideas for free things to do in Brisbane. The sub-tropical climate you’ll find in Brisbane is ideal, it doesn’t hit the scorching highs in summer that some parts of the country do but winter is mostly spent in shorts and t-shirts with plenty of beach visits all year around. The city has it’s own surf patrolled (man made) beach and plenty of parks and attractions but as with any city after a day or two, or a solid 9-5 week, you’re probably going to want to get outside and explore further afield so we’ve put together a list of our 25 best options for day trips from Brisbane. You’ll find plenty of variety here to suit everyone – couples, friends, families and singles. 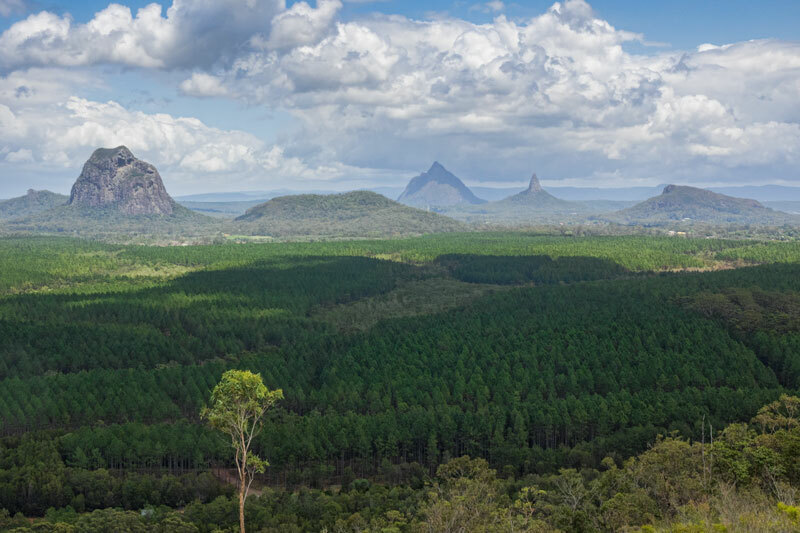 The Glasshouse mountains are at the southern end of the Sunshine Coast only an hour from the city. This distinctive National Park includes 12 distinctive peaks that are the remnant cores of 26 million year old volcanos that once towered above the region. Some of the peaks have paths you can walk up easily such as Wild Horse Mountain where this photo was taken from, other’s require climbing expertise and equipment for those we prefer the walking trails that circumnavigate them from below. There are a few cafes in the area, our pick is the Lookout Cafe for its gorgeous outlook, then just carry on a few hundred meters further up the mountain for the lookout park with incredible views, walking trails and wildlife. 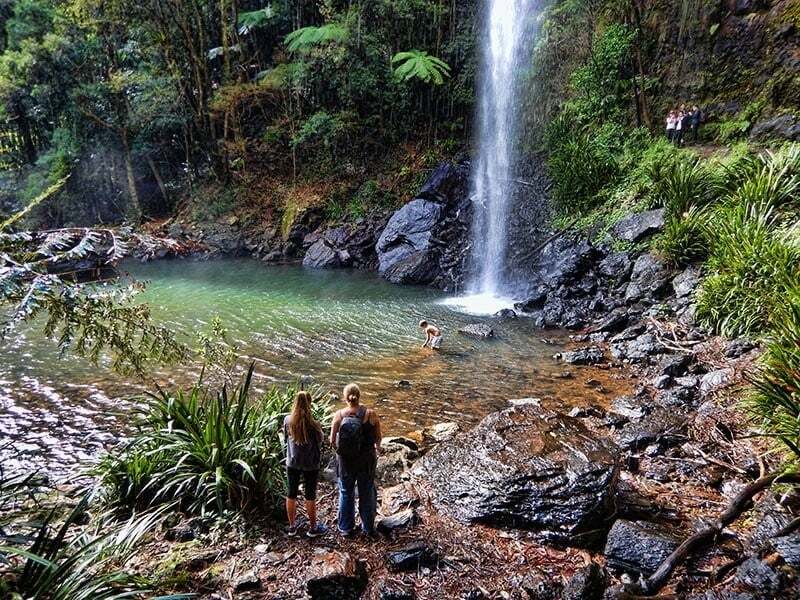 Heading south of Brisbane to the Gold Coast we are often drawn to the beauty of the Lamington National Park. There are 2 sections to this park which are accessed in very different ways so make sure you are headed to the right part. The Green Mountain section is our favorite and commonly known as O’Reillys for the family that originally settled here and a man that carried out an inspiring rescue against the odds when a passenger plane crashed in the area back in 1937. Today you’ll find a variety of walks many suitable for the whole family in pristine rain forest and some great destinations on these walks such as the Elabana Falls shown above. There’s car parking, BBQ’s, plenty of picnic space and a shop and cafe here. If you’re looking for something longer than a day trip there’s a variety of accommodation right at the park entrance from camping to luxe apartments with private outdoor spa’s. We’ve stayed here a couple of times and if you’re interested this article will give you an idea of whats available and some of the other activities. If you love Australian wildlife this is a sure spot to see pademelons, a small species in the wallaby and kangaroo family and the bird life is extensive, we’ve seen a huge variety here including the elusive Alberts Lyrebird and rainbow pitta. Just a 25 minute ferry trip across Moreton Bay is North Stradbroke Island, a laid back island paradise right on the door stop of the city. There’s a lot to love about a day trip to ‘Straddie’ as it’s known locally but for us it’s a tie between the wildlife, scenery and fabulous beaches. There’s also a couple of good cafes popped up on the island recently. You can take a car across on the car ferry but you’ll have just a much fun jumping on the bus that meets the boat and heading up to Point Lookout. This is where you’ll find stunning surf beaches, the gorge walk, lookouts and more amazing beaches. If you visit in the ‘winter’ you can watch the whales passing on their annual migration, pods of dolphins playing in the surf and sea turtles feeding in the gorge. There’s also a big mob of kangaroos and you’ll usually spot at least some of those. Surfing and beach days are popular on the island all year round. We met one young Kiwi visitor who was so impressed after having dolphins join her on her wave while body surfing that she was making an impromptu decision to turn her day trip into an overnight stay hoping to repeat the experience again the next day. Moreton Island is sometimes referred to as Tangalooma after the major resort on the island. While there is plenty to see and do out here on the island if you wanted to stay a few days it’s also a fantastic day trip. The boat runs out here from Brisbane in the morning and after a short stop you can rejoin it during the ‘winter’ months to head out whale watching. Early in the trip we spotted turtles, dolphins and off the coast of Morton Island is where I saw my very first dugong. 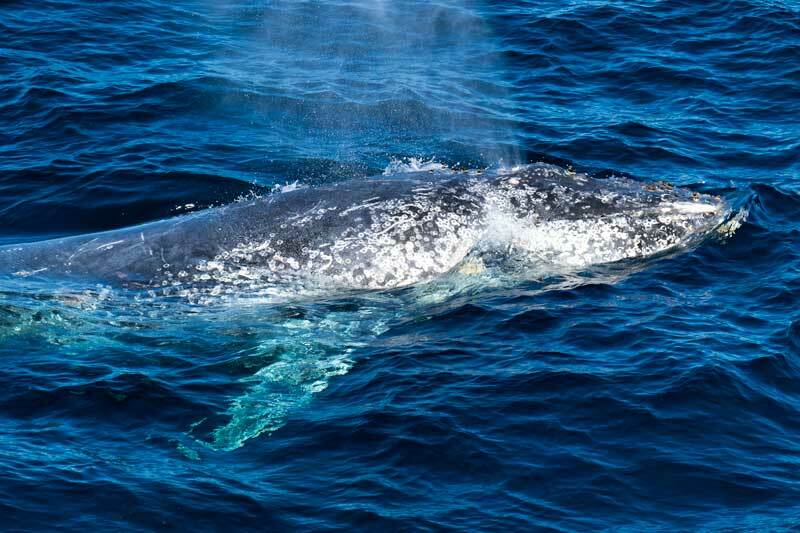 The whales are in transit from Antarctica to the Great Barrier Reef but they still show a natural curiosity in checking out boats so the sightings were good. We had lunch on the boat then when you get back to there island there’s time to explore. There are wrecks offshore that have formed into reefs and provide a home for a good variety of sea life, you can hire a kayak to take a look if you don’t want to snorkel or dive. You can also hire cycles with sand tires or head out sand tobogganing. As a day visitor we were able to use the resort facilities and we stayed on into the evening taking the last boat back to see the great sunset and the other special attractions of Tangalooma, the visiting dolphins. Early in the evening a pod of wild dolphins come into shore and under a special licence you are able to feed them here. The history of this goes back a long way and led to Nari, one of the dolphins a decade or so back being able to be rescued, healed and returned to his pod after he was badly mauled by a shark (you can read more about Nari in the article below). Care is taken to ensure they are given locally caught fish and that what they receive only makes up only a small portion of their daily diet so they eat and play naturally the rest of the time. Not every dolphin in the pod comes in, and those that do don’t come in every day, trained staff supervise every encounter to ensure it is done in a safe way and of course you must not touch the dolphin. 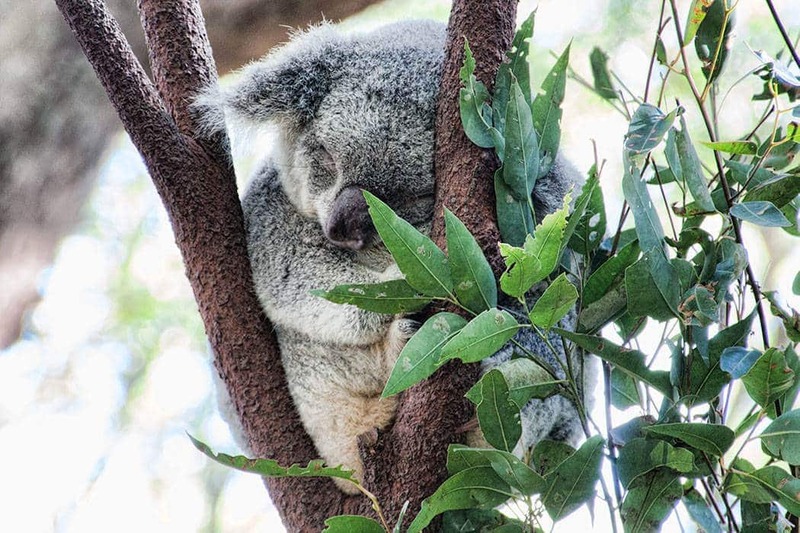 While I’ll highlight many spots to encounter Australia’s wildlife in their natural setting near Brisbane in other sections of this post, visitors may want to include a wildlife sanctuary during their time in Brisbane to see a variety of the Australian animals and for the educational aspect. For that we’d recommend either Currumbin or the nearby David Fleay Wildlife Park . These two have a strong conservation focus, they prioritise local wildlife over exotics their priority is animal welfare, conservation and education. There are a number of theme parks within easy access of Brisbane that make a great family day trip. 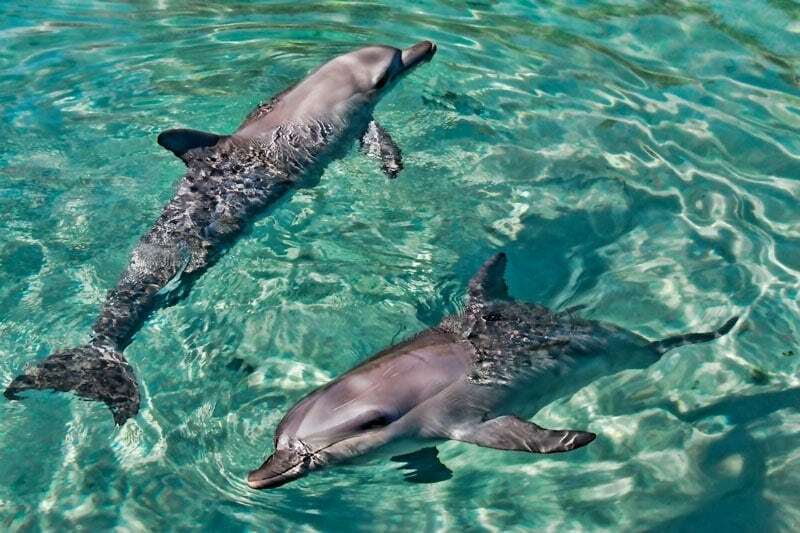 Sea World in Australia is heavily involved in marine rescue and many of the birds and animals here are rescues that were unable to be released back to the wild for various reasons related to their own safety. Sea World is located on The Spit on the Gold Coast around an hours drive from Brisbane. It’s also possible to get here with public transport or joining a tour that includes transport but we’d highly recommend driving so you can stop off at some of the stunning beaches in the area. In addition to the animals there’s also water ski and jet bike shows, thrill rides, a water park and the Nickelodeon area featuring shows and rides for the younger family members. Another of Queensland’s large sand islands, Bribie, is attached to the mainland by a causeway so you won’t even need a boat to get out here. 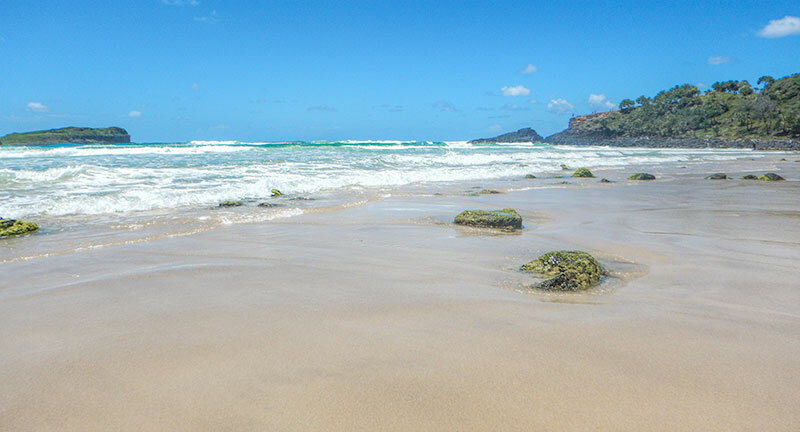 On the inland side of the island are calm waters perfect for a day at the beach with the family, on the seaward side there’s some incredible surf. 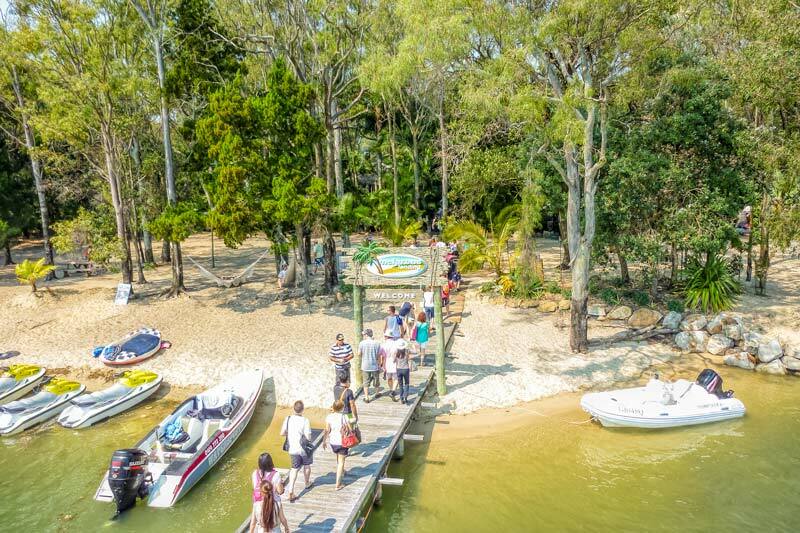 Bribie has had increased residential development in recent years but most of the island is National Park with no roads so you’ll need a 4-wheel drive, permit and sand driving experience to see more than the southern tip. That said, the southern tip is beautiful and you don’t need to walk very far from the car parking to find a good stretch of sand to yourself. The island is also a bird watchers paradise and has some interesting walkways and history to explore. 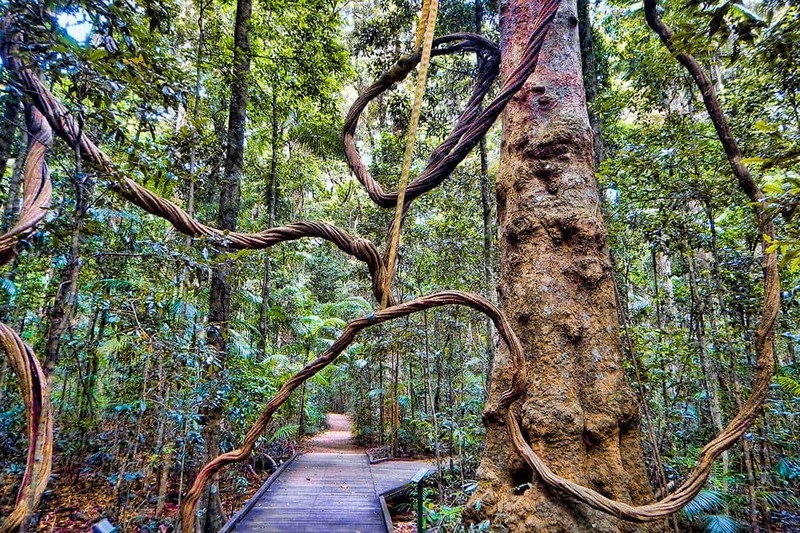 Mount Tamborine is a relaxed hinterland area half way between Brisbane and the Gold Coast. 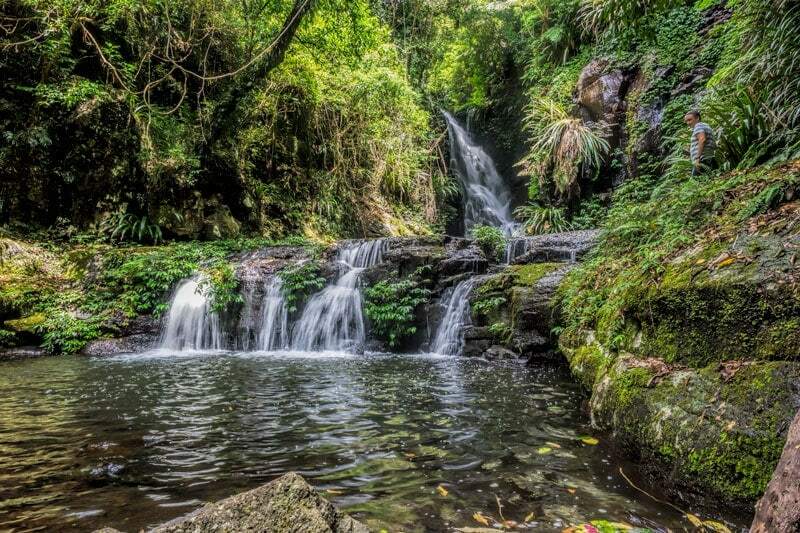 It’s only an hours drive to experience this beautiful area of rain forest on the Scenic Rim. The National Park here is divided into 6 distinct parts containing walking tracks, lookouts, waterfalls and other attractions. Some popular sections we enjoy are the Witches Falls and Cedar Creek tracks. On Mount Tamborine you’ll als find the Gallery Walk with restaurants and interesting shops to explore, an botanic garden, the Skywalk where you can observe the rain forest section from above and within, glow worm caves plus a variety of foodie treats from cheese makers to wineries. Another spot on the Scenic Rim with excellent National Park walks and fabulous scenery is the Springbrook National Park. There’s a whole list of walks and lookout’s we enjoy down here but two I’d highly recommend when visiting are the Twin Falls circuit shown above and the Natural Bridge, click on either link for more visitor information. It’s quite possible to do one in the morning, visit another spot such as Goomoolahra Falls for your picnic lunch then complete the other walk in the afternoon. Toowoomba is a provincial city 125 km inland from Brisbane. A day trip out here can include the impressive lookout, one of the best Japanese gardens in Australia. For foodies you’ll want to check out the farmers markets, farm gate sales and cellar doors. In the city itself there is a thriving cafe culture that’s spring up in recent years and a fabulous collection of street art murals. 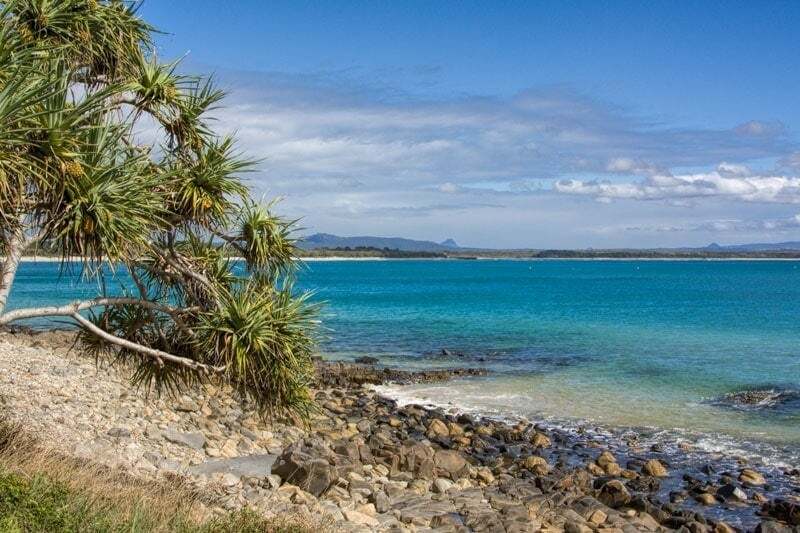 At the northern end of the Sunshine Coast, about a 90 minute drive from Brisbane is Noosa. This popular holiday area also makes a fun and easy day trip from the city. 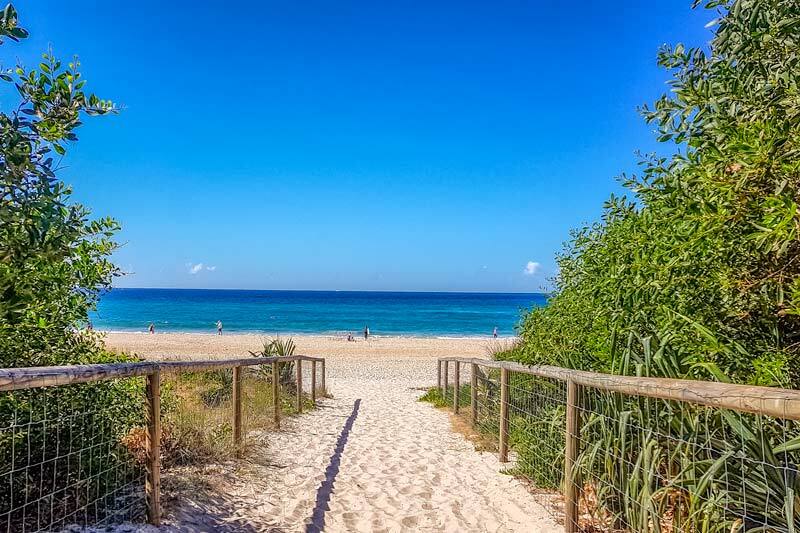 The main beach of Noosa is popular with surfers and can be quite busy but walk a little way down towards the river and the beach is just as good and almost deserted a lot of the time. Keep walking and you’ll come to a sheltered calm water swimming beach and the river. From here is a great place to watch the sunset. 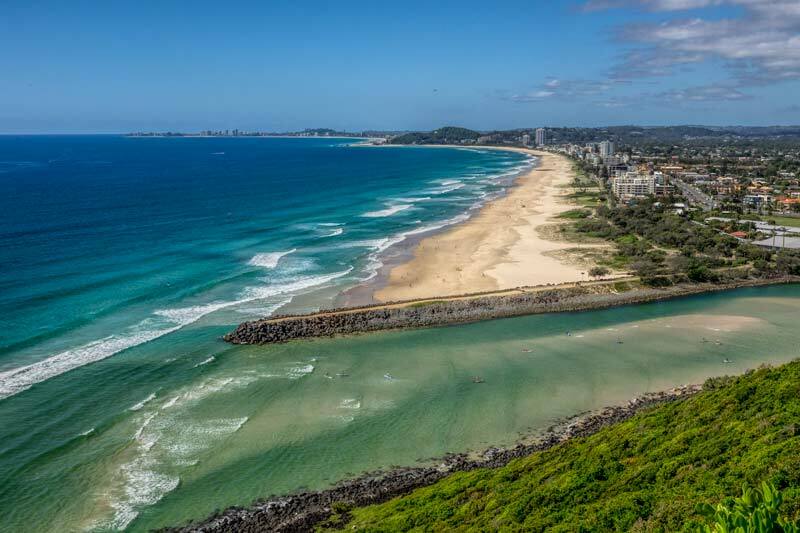 The Burleigh Heads National park is only 27 hectares but squeezed into this space you will find rainforest habitat, eucalypt forest, groves of distinctive coastal pandanus, tussock grassland, coastal heath, creeks and mangroves, the rocky foreshore and glorious sandy beaches. The rainforest circuit where this photo is taken from is 2.3 km return, there’s also a ocean view track which we normally like to take on the return walk but unfortunately it’s currently closed after some rockfalls. If you enter from the northern end off of the Gold Coast highway and turn into Goodwin Terrace you’ll find public parking here and also an excellent selection of local cafes to complete you day trip experience. 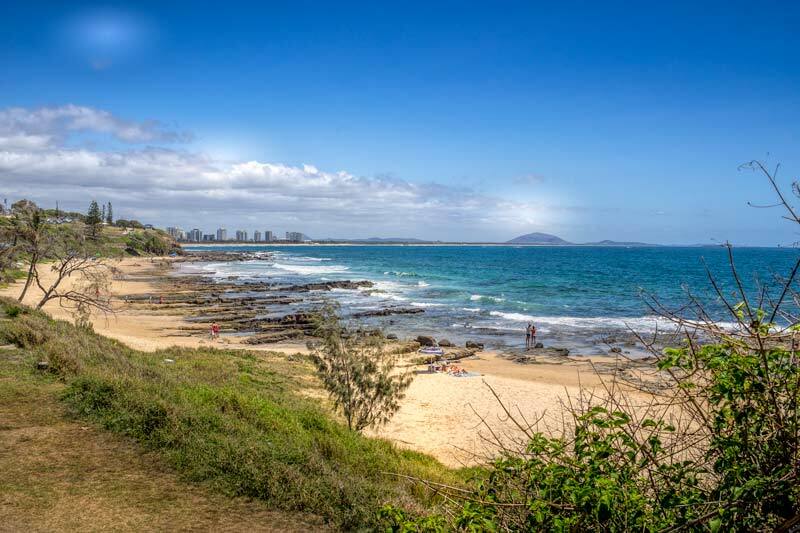 Mooloolaba is one of my personal favourites on the Sunshine Coast. You have a long stretch of gorgeous sandy beach here, a shady boardwalk, many park areas, the river and a break wall between the ocean and the river that’s a popular walk and fishing spot. You’ll also find Sea Life Sunshine Coast which we’ve reviewed previously and a wide selection of cafes, restaurants and accommodation. It’s a 80 minute drive from Brisbane and makes an ideal day trip destination with so much to do. 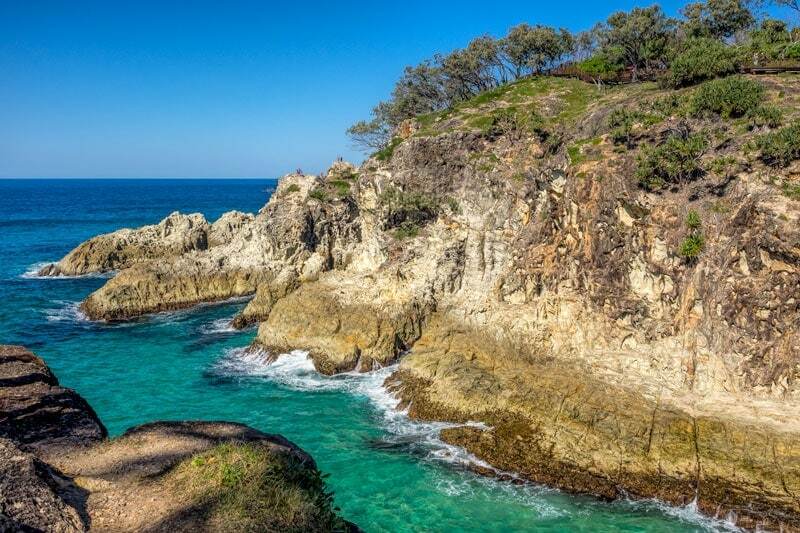 There are a number of tours that run out to South Stradbroke Island from the Gold Coast, it’s actually only 200 metres off the end of the Spit so it’s a quick trip over then you can spend your day as you wish, enjoy the facilities of the Couran Cove Resort, swim and explore the 22 km of sandy beaches & 1800 hectare conservation park. For something a bit different you can kayak out to Wavebreak and South Stradbroke Islands on a full day trip with time to explore, lunch, relaxation and activities on the island. We’ve kayaked out with a group a few years ago and it was way easier than we expected. The most famous and longest established of the Gold Coast beaches is Surfers Paradise, it’s still a lovely stretch of sand with a wide promenade and some great cafes, restaurants and accommodation. Over the years Broadbeach & Mermaid Beach, one beach south, has become our favourite being a little more laid back and home to some of our top picks for cafes on the Gold Coast. All three are surf beaches with wide expanses of soft white sand and have designated patrolled swimming areas. 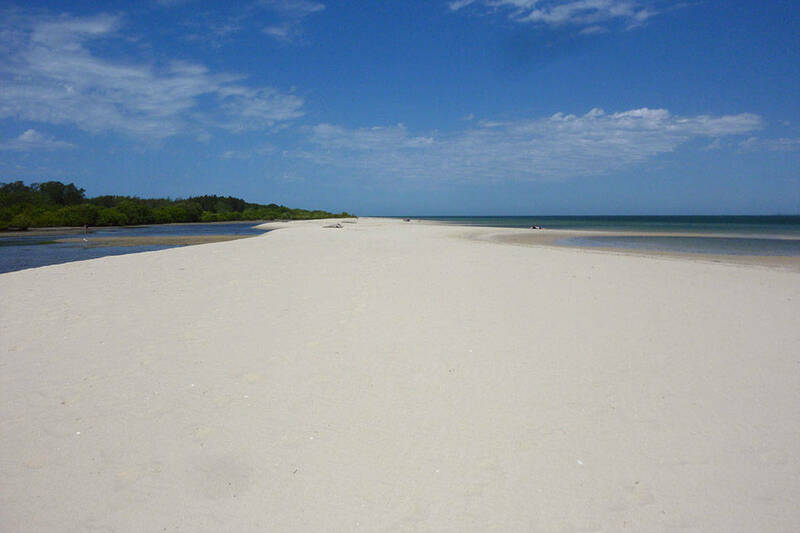 Also in the northern group of beaches to explore are Main Beach, the Spit and the Broadwater. 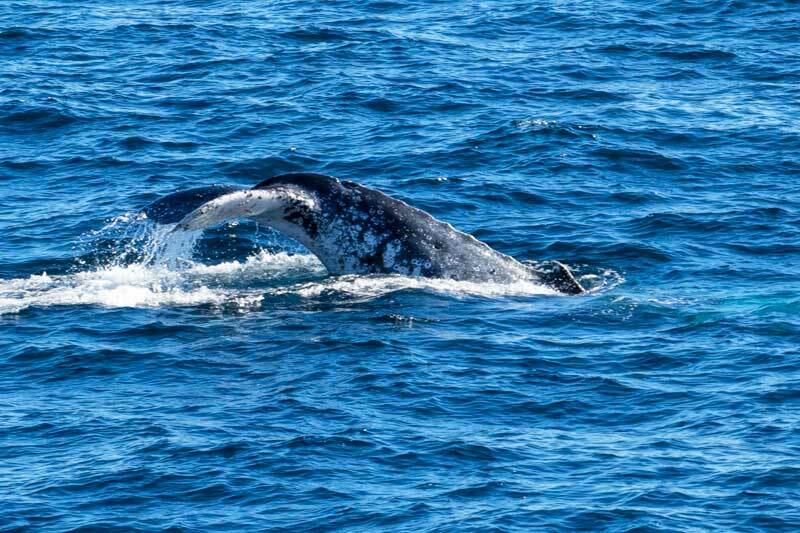 We’ve been whale watching many times along the east coast of Australia. Our most recent outing was on the Gold Coast. This migratory group of humpback whales make their way from Antarctica to the Great Barrier Reef each year. They are estimated to number over 30,000 based on an annual whale census and their numbers are recovering annually. This means you have an excellent chance of some good sightings between August and October each year. We booked for the morning trip as winds and waves tend to increase later in the day and saw a good number of whales, if you’re unlucky and for some reason don’t see a whale you can take a second trip for free. The Wivenhoe dam was built on the Brisbane river in the 1970’s to protect the city from floods. Not only is it now the main water supply for the city but it’s also a great recreational destination for swimming, kayaking and sailing. There are a number of recreational parklands around the lake and not all of them allow for water based activities with restrictions for safety reasons around the spillwall. This one closest to the spillway is one that doesn’t allow direct access to the water but it has extensive park and picnic areas and it’s a great spot for koala spotting. 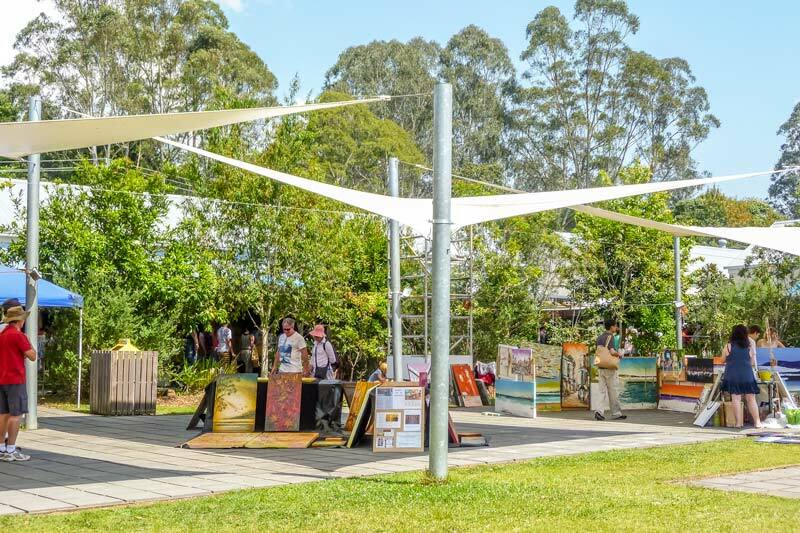 The town of Eumundi is well known for the huge and diverse Eumundi market, an ever growing market encompassing local artists, craft, produce and more. Originally it was all outdoor stalls but developments in recent years have expanded the market area including some undercover options. The town has bars and cafes to stop and relax if you want somewhere to stop for a while or grab something from the market itself and you’ll find plenty of places to sit on the grassy banks. There are regular events here too, one we really enjoyed is the Eumundi body art festival. In the Blackall ranges on the Sunshine Coast you will find the Mary Cairncross conservation park around 90 km from Brisbane. There are 55 hectares of sub-tropical rainforest on the mountain here and a well developed walking path and boardwalk in parts. Despite that it’s an excellent spot from seeing local wildlife including birds, pademelons a small marsupial in the kangaroo family and even the endangered mountain crayfish, a blue coloured found only in a couple of mountain ranges around here above 240 metres. In addition to the walkway you’ll find parklands, BBQ and picnic facilities an information centre and cafe. 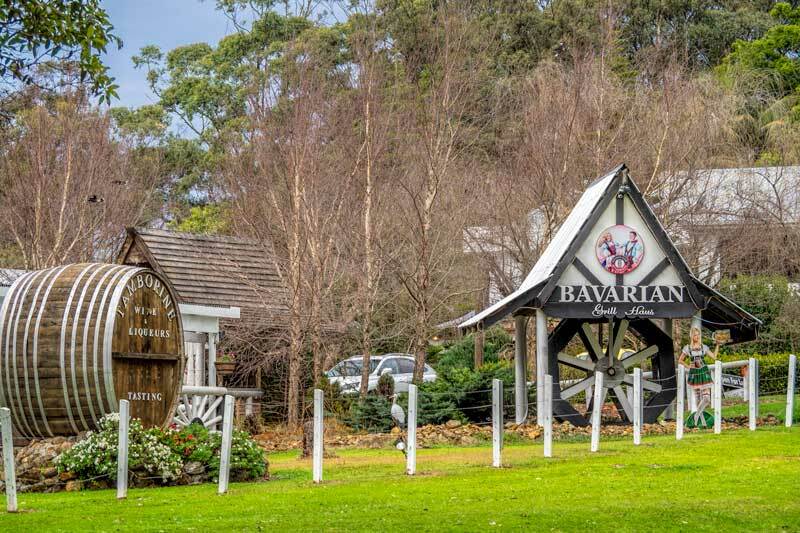 A visit here is ideal to combine with exploring the mountain villages of Maleny and Montville. With 66km of stunning Gold Coast beaches it’s going to take a lot of time to visit them all so it’s necessary to make some choices to narrow it down. 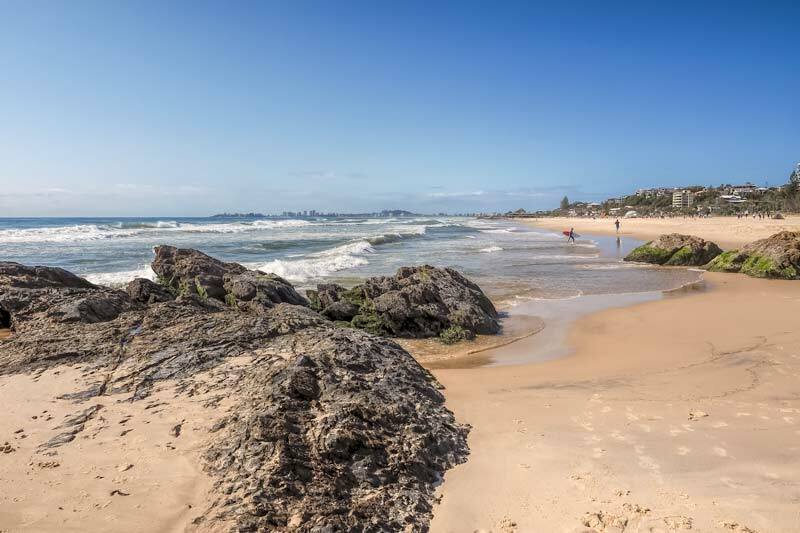 The attraction of the southern Gold Coast beaches including Burleigh, Currumbin, Tugan and Kirra are that they are a little less developed and quieter than the northern beaches. They are all strikingly beautiful surf beaches with wide white sandy stretches, many have dune areas and a couple have lagoon, mangrove and creeks heading inland. 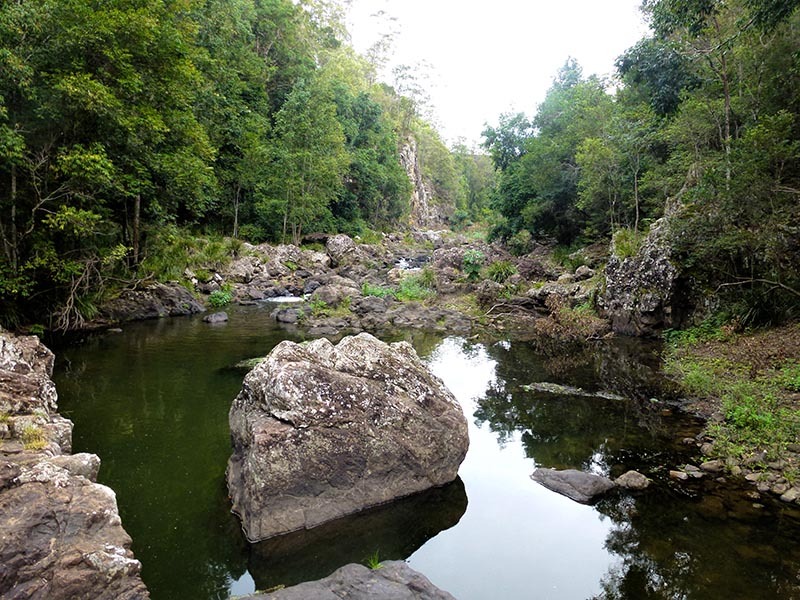 The Obi Obi gorge is a diverse natural area on the Sunshine Coast near Maleny. It’s located next to the Baroon Pocket Dam and from here you can take a 7 km return walk on the Baroon Lookout track, the views from the track are fabulous and you generally see diverse bird life along the track. Not far from the car park there’s a detour down to the gorge and swimming hole. Another alternative is rock hopping along the gorge but be prepared to get wet in parts. 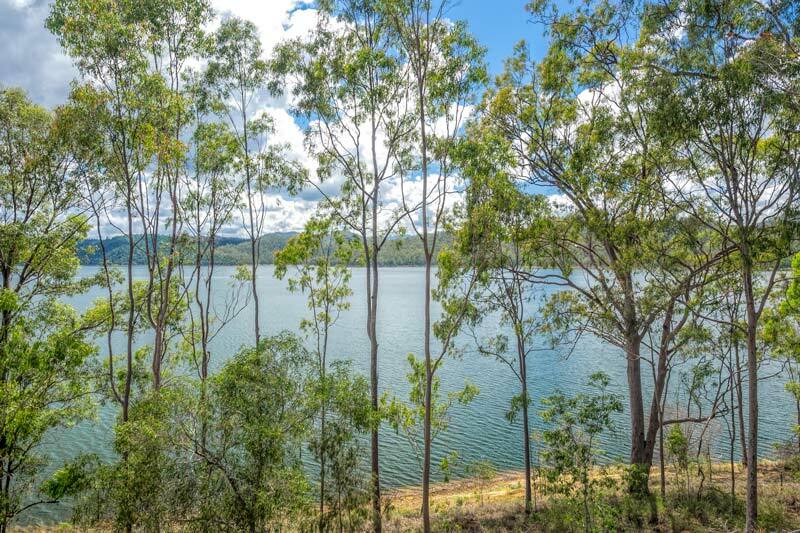 The are picnic and BBQ facilities nearby at the lake edge and across the dam wall or head back up the road into Maleny for a variety of cafe options. Byron Bay is a 2 hour drive from Brisbane and I have to admit I do prefer to stay down there for a night or two when we go but we’ve done it as a day trip several times with friends and visitors and if that’s what works for your itinerary then I’d definitely make this trip for the day, you can see and do plenty in that time. 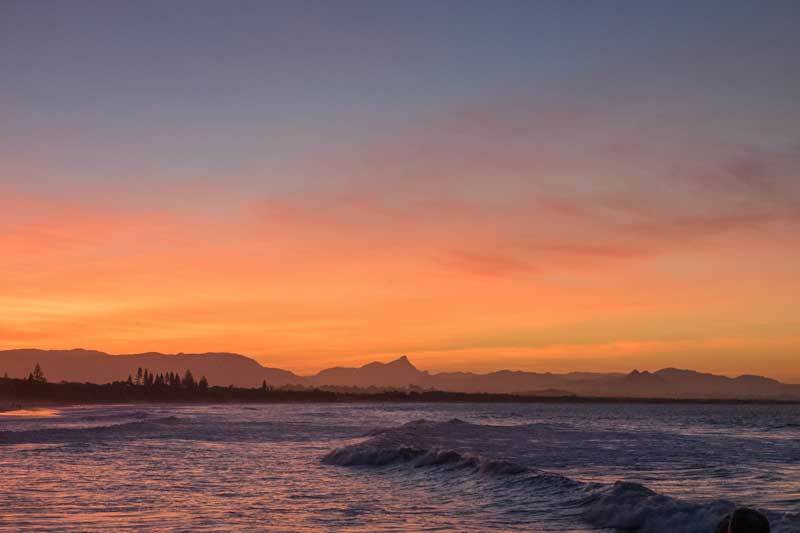 Byron Bay retains it’s laid back surf vibe despite it’s ever increasing popularity and while getting a car park can be a challenge some days you are sure to find yourself a wave and space on the sand at one of it’s 9 stunning beaches. Byron is an iconic Aussie destination and we highly recommend a visit. Around an hour and a half from Brisbane you’ll reach the northern New South Wales beaches including Fingal Head, Kingscliff and Salt beach. It’s a popular holiday destination and increasingly growing as a residential subdivision but still relatively quiet. The beaches here are gorgeous for long relaxed walks, beach days and there’s a wide walking and bike path shaded in part by the casuarina trees along the beach edge at Kingscliff. From Fingal head and many of the other headlands along here you’ll see whales passing during the migration season and don’t miss the Giants Causeway, an interesting basalt lava rock formation that extends under the water to Cook Island. My 2 final suggestions are annual events,, these are just 2 examples but there are many regular events that make a great addition to a day trip in the region. 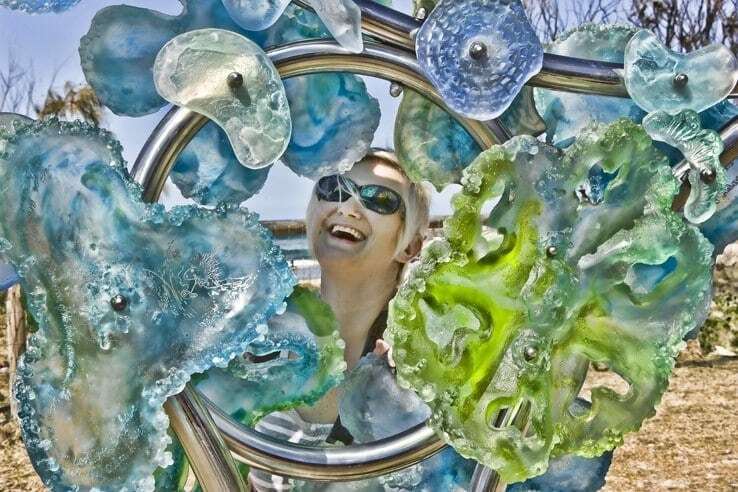 The Swell Festival has been running for many years during the month of September and includes many local and international artists who create sculptures, often of significant size on the beach and foreshore in Currumbin. During the festival you’ll find coffee vans and food trucks offering variety on top of the local cafes, live music and other entertainment. The sculptures are also lit at night adding a different way to enjoy them. 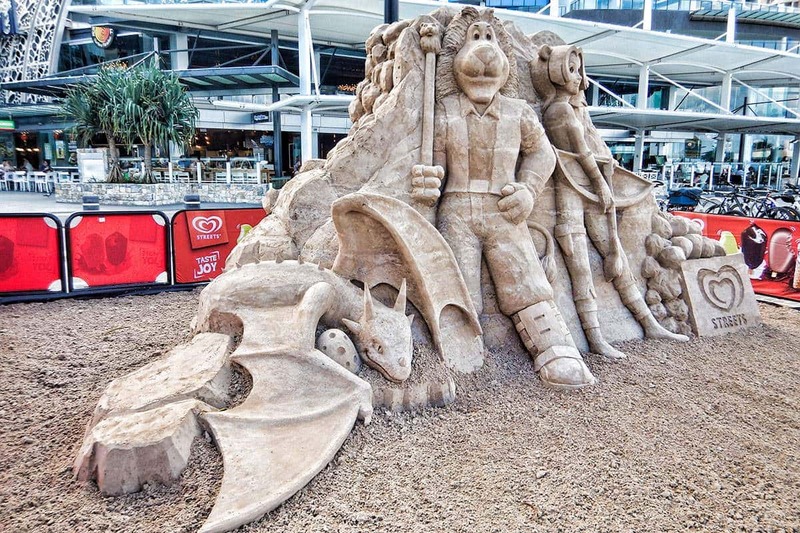 The Sand Safari is another annual event, this time in February and held predominantly at Surfers Paradise although related displays pop up around the Gold Coast. The enormous sand castles are created by international and local artists along the wide promenade in front of the beach, The artworks usually take the shape of fantasy and cartoon characters which are loved by kids and adults alike. They are made entirely of sand and water then sprayed with an environmentally safe sealant to help them stand up to the elements for the duration of the festival. During the event you an vote for the one you like the best and there’s an extra large central display which is worked on by many artists for you to watch the creators at work and ask any questions. The festival is perfect combined with a day at the beach or exploring Surfers Paradise, the best known of the Gold Coast beaches. Have you visited one, or all, of these fantastic destinations near Brisbane? Do you enjoy day trips as a way of exploring a region? If you have any questions when planning your visit please ask in the comments section below. For those places you want to add to your itinerary we have in depth articles full of tips on many of them that we’ve also linked up above.